The Young and the Restless (Y&R) spoilers for the next two weeks tease that things are about to get even hotter on the CBS soap. The week of April 16-20 will bring a stunning cover-up. Nikki (Melody Thomas Scott) delivered a powerful blow to the head, so J.T. (Thad Luckinbell) won’t have a pulse when the ladies check. Once they realize J.T.’s dead as a doornail, they’ll worry about the cops twisting this. Sharon (Sharon Case), Phyllis (Gina Tognoni), Victoria (Amelia Heinle) and Nikki will all agree to keep the truth under wraps. J.T.’s body will be put six feet under, so the nervous women will have a dangerous secret to keep. Meanwhile, Paul (Doug Davidson) will put out a warrant for J.T.’s arrest. After new information comes to light, Paul will want to lock J.T. up for attempted murder. Later, Paul will get a search warrant and dig around at Victoria’s place. He’ll hope he can find some clues about J.T.’s current location. Y&R fans can expect some tense moments as Victoria and the others hide their actions. Nick (Joshua Morrow) will pressure the cops to get some answers, so that should make all this even more distressing for the cover-up squad. After Jack’s (Peter Bergman) released, The Young and the Restless spoilers say he’ll track down Kyle (Michael Mealor) and add some fuel to the fire. This father-son battle will really spiral out of control! During the week of April 23-27, Victor (Eric Braeden) will take charge of a situation. He’ll still be recovering, but he won’t let that slow him down too much. Victor will undoubtedly delegate some tasks and accomplish his goals. Will this be about finding J.T. or possibly protecting Nikki and Victoria? Could it tie in with his Kyle scheme instead? Regardless, Victor will make sure no one stands in his way! 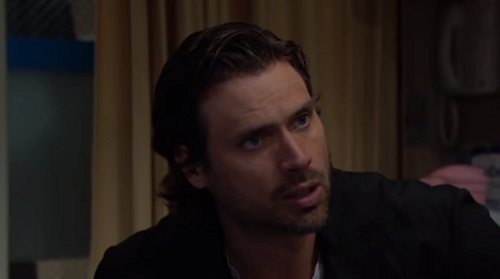 Other Young and the Restless spoilers say Nick will find out a big secret. It sounds like Victoria may come clean about Nikki killing J.T. to protect her. Since Nick will be so fired up about locating the menace, Victoria may feel like she needs to fill her brother in. She might hope that he’ll back off and let Paul’s investigation grow cold. Reed (Tristan Lake Leabu) will demand answers from his mother at some point. He’ll want to know if there’s any truth to what everyone’s saying about his dad. J.T. will be an infamous attempted murderer by then. Reed may wonder if Victoria knows exactly what went down. He’ll have questions about J.T.’s whereabouts, too. Victoria will have to decide how much she’s going to reveal to her teen. Things will definitely get tricky in the coming episodes. Finally, Hilary’s (Mishael Morgan) life will be turned topsy-turvy. Will some baby drama throw her for a loop? It looks like Hilary may be pregnant, so she could have a lot on her plate soon. Y&R viewers definitely won’t want to miss all the pandemonium in town. We’ll give you updates as other news comes in. Stay tuned to the CBS soap and don’t forget to check CDL often for the latest Young and the Restless spoilers, updates and news.